An explosion of chorizo-based hashes are popping up on my Hashcapades twitter feed. Each tweet taunts me with a delicious picture of culinary perfection or the miraculous hangover/jet lag cure that Chorizo hash provides. Well, I can play that game too – Cho-rrrrri-zo hash – Olé! Once I latched on to the obviousness of the truth (there is no spoon) I proceeded to pencil out my idea of a chorizo hash. Comfort food with a Oaxacan flair, a little Old World meets New World, a little ooh, as little ah. And so it was that I combined some ideas from Yolk (zucchini in the hash) and my Halibut Hash (Avocado Crema and Tomatillo Sauce) to create this masterpiece! I got the goods, now let's get busy! Roasted tomatillos, garlic & jalapeño. 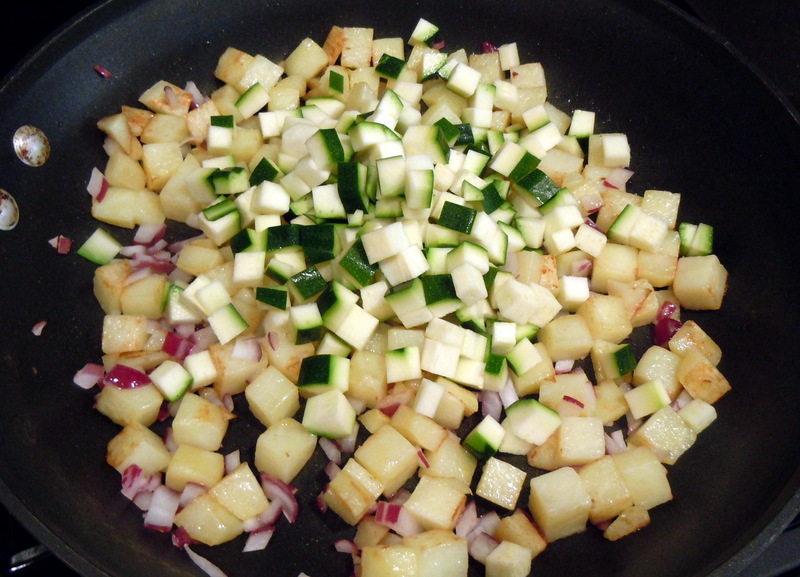 Yukon gold potatoes, zucchini and red onion. The basic process was fairly straight forward – dice potatoes, onion and zucchini and cook, starting with potatoes for 10 minutes, add onion for 5 minutes then add zucchini for another 5 minutes. In parallel, I cooked the chorizo for about 7ish minutes and set aside on two layers of paper towels to let the grease drain. Also at the same time, I broiled the tomatillos, garlic and jalapeno on high for 10 minutes, then made the tomatillo sauce and avocado crema. Simple! Dreaming up a recipe is a form of risk taking, pure and simple – no safety net, no harness. Sometimes the balance of flavor is just off and I adjust my recipe. Sometimes the ratio of veggies to meat leaves me wanting. 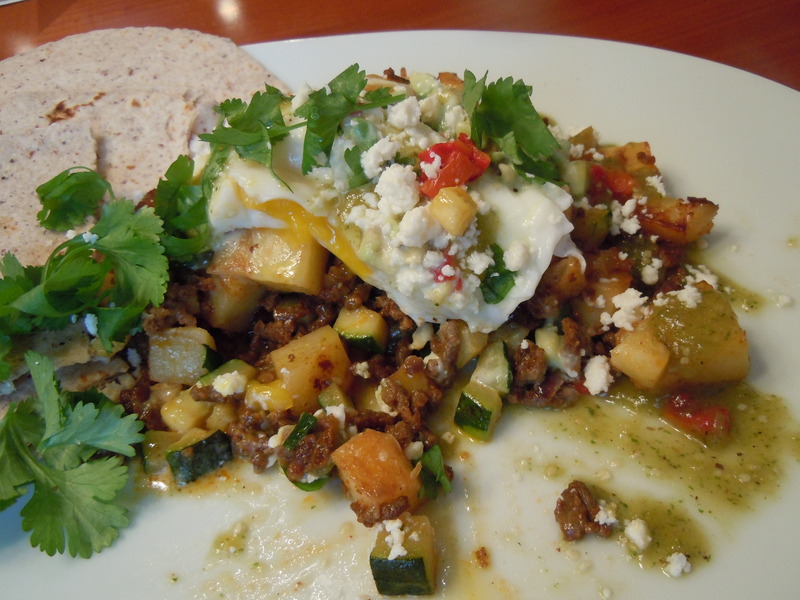 I’m please to report that the hash delivered a balanced, powerful Oaxacan kick to the taste buds – heaven! Zucchini? It added another layer of toothy goodness, a new ally for my potatoes. 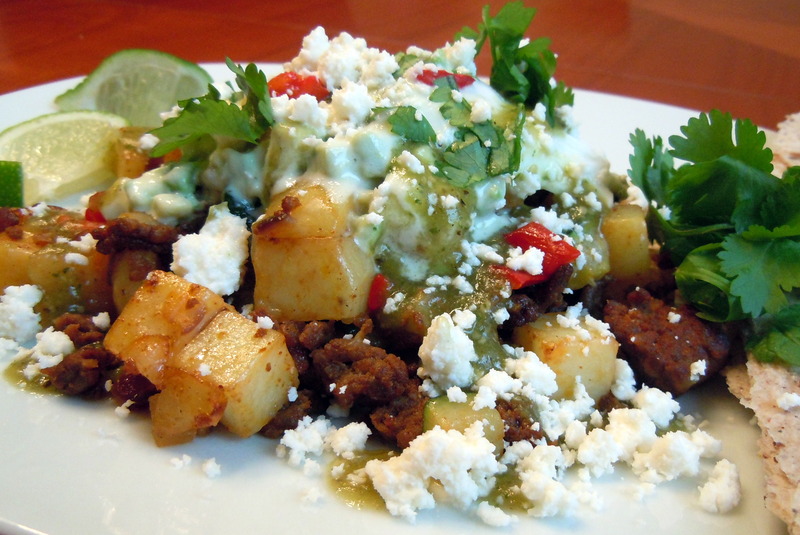 The spicy chorizo hash covered with the smoky tomatillo sauce and avocado crema was simply incredible. Oh, and don’t get me started on the creamy egg erupting like a fiery yellow volcano all over the hash! 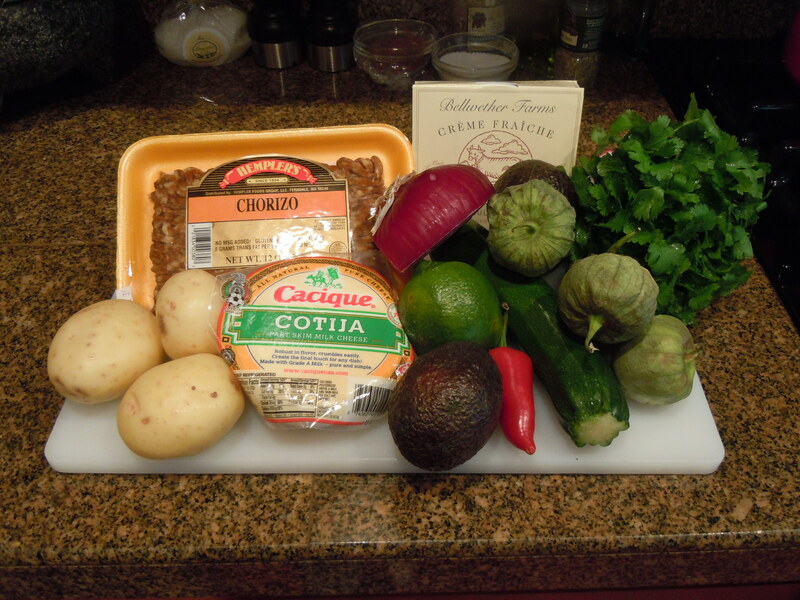 Many of these sections can be done in parallel, for example, start the broiler as the pans heat up, doing the Chorizo, Potato & Tomatillo sections in parallel. 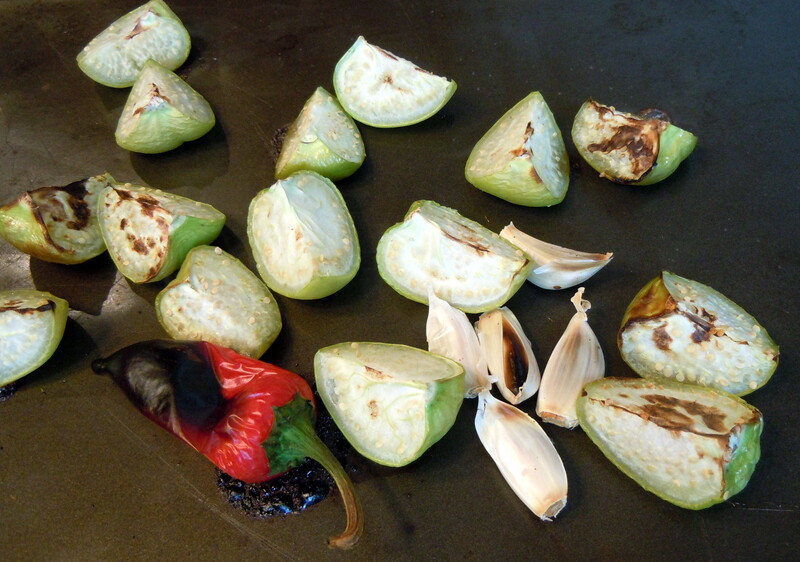 > Remove, peel roasted garlic and place tomatillos and garlic only in a blender and mix. > Spoon more crema and sauce in little spots, garnish with the diced red jalapeño, cilantro and cotija cheese. This entry was posted in Chez Clark Hashcapade by hashcapades. Bookmark the permalink.